Team New Zealand is ready to tour India for 3 Test match and 5 match ODI series in September - October 2016. You can start booking tickets for India (IND) vs New Zealand (NZ) Test match and One Day Internationals matches here in various venues in India. BCCI in association with online ticketing partners will sponsor the tickets for matches scheduled later this year. The ticket prices, fare and availability will depend on stadium seating and online booking system. You can also buy the official tickets through BCCI by visiting the respective venues at stipulated mentioned dates. The Black Caps team led by Kane Williamson will be eager to take charge against Virat Kohli and men in the encounter of 3 Tests and 5 One Day Internationals. Both teams hunting for some good form in longer formats will battle themselves out in the sub continent ground of India. After a good series against West Indies, Virat Kohli and men will know the success ratio of New Zealand's current ongoing form in Test matches and their recently concluded good win against Zimbabwe. Men in Blue needs to win the 3 match series against Black Caps to regain number one rankings in Tests. However if New Zealand turn things around against India, they will come right behind India at number 3 rank. How India Vs New Zealand is shaping up for some good excitement? Each team knows their strengths and weaknesses, however India looks much better outfit when they play here in sub continent wickets. Meanwhile New Zealand has shown some promising show here last time around during the T20 World Cup event in India. Most probably captain cool - Mahendra Singh Dhoni will return to shorter formats to give support to Team India in ODI's. This year captain Virat Kohli is in the form of his life and his batting will definitely speak class apart when he holds fort against NZ. There has also been talks of M.S.Dhoni's ability for captaining the side in ODI's and producing the desired results and goods, which he has definitely lived up to the expectations! Again underdogs New Zealand known much for their overall ability in batting recently will rely on the class of Williamson and Guptill. Both sides have equally good bowlers and spinners for overall performance. This series might well become a batting paradise journey where wickets in India usually offer lots of runs with little help to the bowlers. The test series will be the testing times for both teams to try out different options in the longer formats. 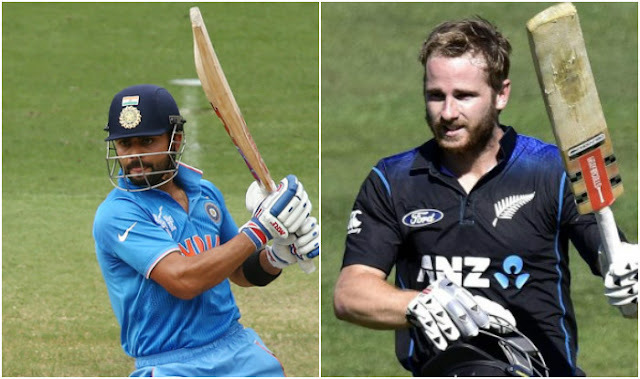 Virat Kohli has been seen taking a 5 bowler attack usually on sub continent and other wickets as well, however Kane Williamson might well choose to have the same from his end to maintain an equally balanced attack. Please refer to the details below on how to purchase tickets and schedule for online sale of tickets through BCCI's approved online partners. After knowing each other in the tests, both teams will change their strategies as MS Dhoni leads the Indian side backed by Virat Kohli and men. New Zealand will have revamped side with Guptill and Anderson joining with Tim Southee leading the pace attack. You can refer below on how to buy tickets from BCCI's official sources and online ticketing partners and know the price / fare and availability of the tickets at each venue. People who are definitely looking forward to the series and looking to visit the stadium to view the matches this time can book tickets online to avoid rush at last minutes to visit the venue for tickets. BCCI is authorizing online ticketing sites like BookMyShow, TicketGenie and Kyazoonga for further relay of information of tickets. The prices of tickets will vary from venue to venue and it might range from Rs.750/- to Rs.5000/- per head based on seating selection by the audience. You can select to book multiple tickets and seating arrangement within the stadium and pay the amount online. Tickets will be issued and sent to the address registered within 2 days of time. You will also need to produce a copy of your identity card proof and debit / credit card through which payment was made at the venue box office during the scheduled match day. guys how i can book ticket for online for first ODI match??? Is there any easy way to get a ticket online... I'm unable to find any trustable website who can provide tickets... On BMS there is no information about tickets.. Tel me how to get the ticket for first ODI match at Dharamshala? ?